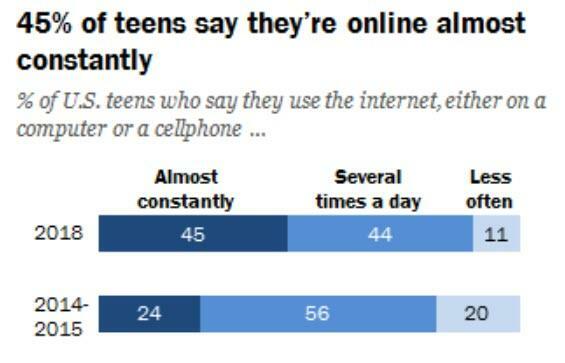 Pew notes that there is no clear consensus among teens about these platforms' ultimate impact on people their age. A plurality of teens (45%) believe social media has a neither positive nor negative effect on people their age. 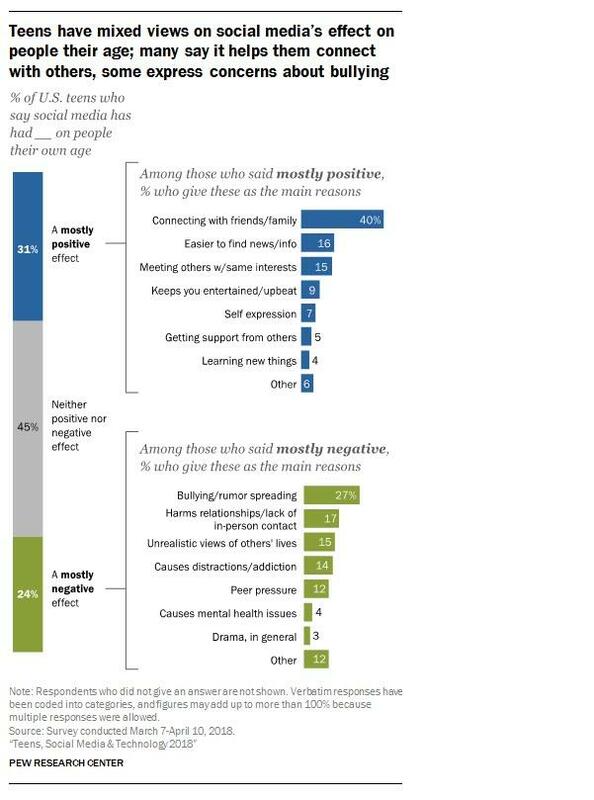 Meanwhile, roughly three-in-ten teens (31%) say social media has had a mostly positive impact, while 24% describe its effect as mostly negative. Meanwhile, 17% of these respondents feel these platforms harm relationships and result in less meaningful human interactions. Similar shares think social media distorts reality and gives teens an unrealistic view of other people's lives (15%), or that teens spend too much time on social media (14%). Another 12% criticize social media for influencing teens to give in to peer pressure,while smaller shares express concerns that these sites could lead to psychological issues or drama. But, as we detailed previously, there is compelling evidence that the devices we've placed in young people's hands are having profound effects on their lives - and making them seriously unhappy. There's not a single exception. All screen activities are linked to less happiness, and all nonscreen activities are linked to more happiness. Eighth-graders who spend 10 or more hours a week on social media are 56 percent more likely to say they're unhappy than those who devote less time to social media. 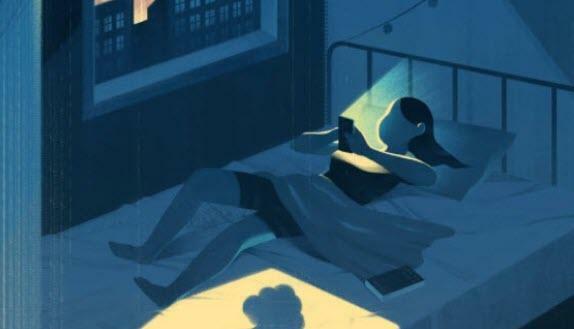 The correlations between depression and smartphone use are strong enough to suggest that more parents should be telling their kids to put down their phone. As the technology writer Nick Bilton has reported, it's a policy some Silicon Valley executives follow. Even Steve Jobs limited his kids' use of the devices he brought into the world. If you were going to give advice for a happy adolescence based on this survey, it would be straightforward: Put down the phone, turn off the laptop, and do something-anything-that does not involve a screen. Of course, these analyses don't unequivocally prove that screen time causes unhappiness; it's possible that unhappy teens spend more time online. But recent research suggests that screen time, in particular social-media use, does indeed cause unhappiness. One study asked college students with a Facebook page to complete short surveys on their phone over the course of two weeks. They'd get a text message with a link five times a day, and report on their mood and how much they'd used Facebook. The more they'd used Facebook, the unhappier they felt, but feeling unhappy did not subsequently lead to more Facebook use. 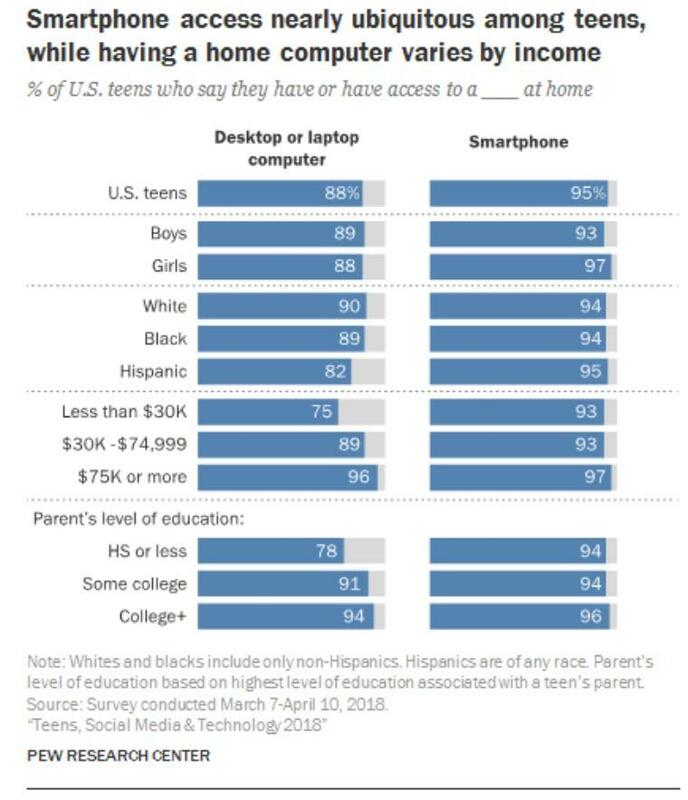 I realize that restricting technology might be an unrealistic demand to impose on a generation of kids so accustomed to being wired at all times. Prying the phone out of our kids' hands will be difficult, even more so than the quixotic efforts of my parents' generation to get their kids to turn off MTV and get some fresh air. But more seems to be at stake in urging teens to use their phone responsibly, and there are benefits to be gained even if all we instill in our children is the importance of moderation. Significant effects on both mental health and sleep time appear after two or more hours a day on electronic devices. The average teen spends about two and a half hours a day on electronic devices. Some mild boundary-setting could keep kids from falling into harmful habits.